Investigators believe the fire started after lightning struck the ground underneath the vehicle. The bolt was so powerful it traveled, damaging a shed just a few feet away. 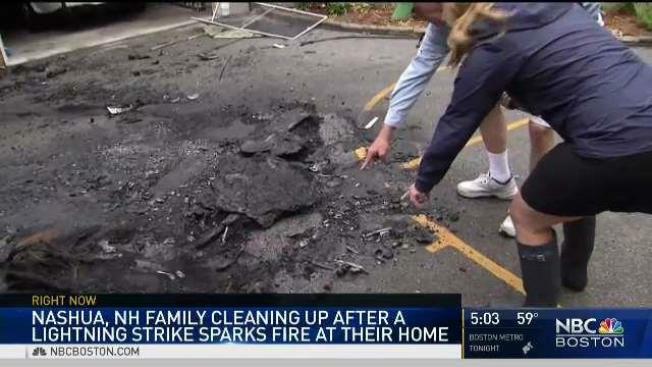 Wednesday’s storms giving one family in Nashua, New Hampshire, quite a scare after lightning struck their driveway and ignited their car. Firefighters responded to the home at 27 Pitarys Drive just after 6:30 p.m. Wednesday night. When they arrived, the Jeep Liberty was fully engulfed in flames. The fire quickly spread to the home and was burning right outside of 10 year-old’s bedroom window. “My room is right there so I can’t imagine just being right there and looking down at the flames like whoa,” Carter Gauthier said, who lives at the home. Fortunately the family was out to dinner when they got the call that their home was on fire so no one was inside at the time. No injuries were reported. “It is very rare for a lightning strike to start a vehicle on fire,” Deputy Chief Glen Macdonald of the Nashua Fire Department said. While the metal frames on cars often direct lightning to the ground, firefighters say damage like this is possible. As the family deals with the cleanup and insurance claims, they are hopeful the lightning does not strike in the same place twice.